Revisiting an older camera with a brand new lens. Just right. I've lately been a bit unconvinced that the Sony a9 is the greatest thing to hit the camera world since through the lens metering. I'm also starting to think that my disregard for that camera grows in proportion to the sheer number of "news" outlets, blogs and review sites participating in the "gush-fest." The all out barrage of reviews and articles, concentrated into a short period of time, seems almost disingenuous. Almost like Sony is trying too hard with their new model. The rush to review it also smells slightly of desperation as well. As if reviewers are so hungry to have a product to tout, and link to, that they've become little more than force multipliers for Sony. While I am fairly sure that the a9 will be a nice camera and people will enjoy using it I am also fairly certain that it won't make people who buy it better photographers and it won't make their photographs any more interesting. Interesting photography generally only happen when one points a camera at something genuinely interesting. I am certain that the a9 will be an effective tool in aiding Sony's quest to pull more cash from people's credit card accounts. None of this has anything to do with what "pros" need or want. And none of this has to do with how much money it may (or may not) cost to switch systems. While I am still in awe at the amazingly detailed files achievable from the A7Rii and endlessly impressed with the 4K video performance of the RX10iii (and its remarkable lens) the most comfortable and usable camera in my small collection is my particular copy of the plain vanilla A7ii. It's a camera I bought used for around $1,000. There was some scuffery on the rear LCD panel which made it much less than minty but since I only use the LCD for menu setting it doesn't affect my use of the camera. 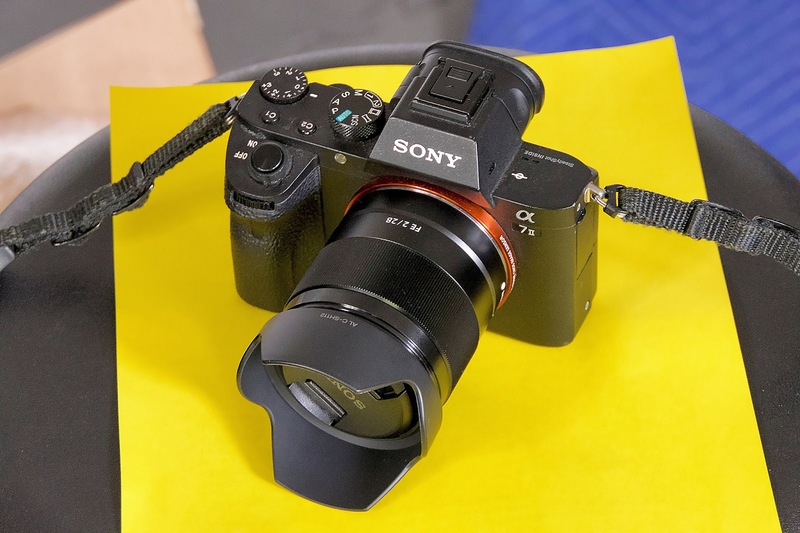 The A7ii is the bottom of the rung when it comes to the newer A7xx cameras. The 24 megapixel sensor, while not state of the art, was good enough for those zany folks at DXO to rate it a 90. The body is small and dense, just the way I like my cameras. The finder is adequate and external controls are nicely designed and placed for me. I've even made peace with the menus; in fact, I now find them almost logical. The camera is the perfect size for me but it also works well with an added battery grip. And sometimes it's nice to go for the grip ... it's great to have a second battery in the mix to allow for more shooting time and less battery monitoring. The camera does nothing very special at all. It just combines a good, high enough resolution capability with a very usable EVF and a workmanlike 1080p video function. But it's the lack of perfection or high performance (or high cost) that endears the camera to me. I am not reticent to use it hard, to carry it with me everywhere and to use it on just about any job. I use the Rii when I need ultimate performance and I use the RX10iii for killer video but I use the A7ii when I want to be comfortable and at home with the camera in my hand. I've recently and slowly been putting together a pared down travel system based around the full frame A7ii. The first choice was the inexpensive FE 50mm f1.8. It's a really, really good lens with nice performance nearly wide open and excellent performance when it gets to f5.6. The next lens in the plan was one of my all time favorite focal lengths, the FE 85mm f1.8. It's a fabulous 85mm. I think I have a good handle on lenses around this focal length having owned, and extensively used, the original Canon 85mm f1.1.2, several variants of the Nikon 85mm f1.4, the Canon and Nikon 85mm f1.8 lenses, the Zeiss 85mm f1.4 for Nikon and other "mystical" lenses such as the Leica 80mm f1.4 Summilux R and the 90mm Summicron R and M.
The new, $600 Sony FE 85mm f1.8 is just great. Nicely sharp wide open and exquisitely sharp a couple of stops down. That left only one slot to be filled and that was the focal length range between 24mm and 35mm. I have several zooms that cover those focal lengths but I was looking for a trim little system that would fit well in a small Domke camera bag to take on the road and in my mind that meant finding a small, sharp single focal length lens. A bonus would be a fast maximum aperture. Sometimes I trust my intuition and sometimes my intuition waffles. I settled on the Sony FE 28mm f2.0 lens but waffled. I read a lot of reviews and then I decided not to procrastinate and I bought a new copy of that lens. It arrived yesterday and I'm smitten. It's small and light, fits well into the travel system, and is fast enough to work in just about any situation, in conjunction with the decent low light performance of the camera. My initial tests show me that the 28mm is sharp in the focused plane, even wide open, and gets sharper and sharper as I stop it down. By f5.6 it's pretty amazing. It shows off amazing nano-acuity. I know that it has a good amount of distortion but this is 2017 and the camera corrects it in Jpeg files while Lightroom and ACR corrects the distortion easily when working with RAW files. Now I have a happy system that delivers wonderful technical performance for the kind of impromptu photography I love to do. I have space in that bag for one more thing. I'd like to find a second well used A7ii body to toss into one of the side pockets of the bag, just for a back-up. I walked with the A7ii+28mm today and I'm very, very happy to have them. They help to make photography fun. Just plain, good fun.